Fish Fry French Style | Simple and Delicious ! Powder or paste mustard and pepper together. Mix fish with the above paste or powder, lemon juice, salt and chilly powder. Dip fish pieces in besan to cover the both sides. This is the French style fish fry.I got this recipe from net long back, unfortunately forgot the site name. This is so simple indeed. I like fried fish a lot. Thanks for sharing this. Love fish fry...of any kinda fish...Are you posting from kerala?? Seena, I have never used mustard seeds in fish fry..and then I read it's a french style fry, it made sense :) Will try this variation! However fish is fried I am in. Looks delicious !! can this be made with Salmon fish? Also Can this be shallow fried instead of deep frying? 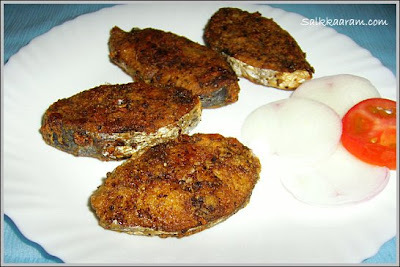 It looks good and sounds quite different than our usual meen fry, so I would like to give it a try soon. Thanks for this recipe. Thanks for the comments, glad to know that you liked the recipe..
Bharathy, thanks and ofcourse am posting from Kerala..
Yeah, surely this tastes different, you can try shallow frying with other fishes. Take care to make the sides of fish are cooked well, other wise tasting raw besan would be bad. Good luck ! Hi Seena, lovely fillets. Fish fry, I like very much. Thanks for sharing your version. nice variation with mustard.Got to try this. hey, how are you ? I think my family would love this dish. What fish did you use? Pravs, currently am in Kerala, doing well dear, what abt you? Thanks Jeena, couldn't c u for long? Sure, your family will love it.I used king fish fillets for making this..
Nice to find your blog. Loved it, doing a gr8 work !! and i look forward to try out fried fish ur kind v soon inshallah. Hi seena, just wondering how u retain the shape of the fish after it is fried, mine always breaks. where do u buy these fillets they looks more in content than the frozen thin ones i get in these stores. Welcome to Simple and Delicious! thanks for the comment, hope to visit your website soon, insha Allah.. These fillets are fresh. All kinds of fishes are easily available here, in Dubai. I tried it out. It was good. Thanks.